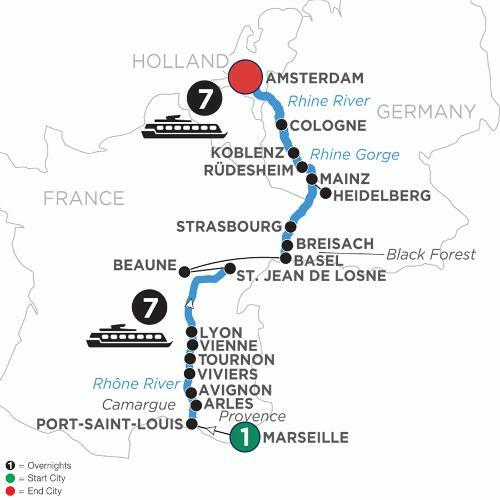 Immerse yourself in French and German culture on this fabulous European river cruise vacation along the Rhône and Rhine Rivers. The views will be spectacular so be sure to pack your camera so you can capture the romance and splendor of this magical journey. Begin with an overnight on the captivating Marseille, and relax along the remarkably blue water of the Mediterranean Sea. Then transfer to Port St. Louis, to start your river cruise and set sail to Arles—famous for inspiring the paintings of Van Gogh and its 1st-century Roman Amphitheater. The city of Tournon is beautifully nestled among vineyards and you’ll go on a guided walk of this medieval treasure with plenty of Roman ruins and a fascinating 16th-century castle. Lyon is a showcase of medieval and Renaissance architecture. Transfer to Basel to explore the legendary Rhine River and its Jewish culture and heritage. You’ll stop in Breisach, the gateway to Germany’s Black Forest, well known for Black Forest ham, cherry cake, and cuckoo clocks. In Strasbourg, France, stroll through the picturesque La Petite France district and the old streets of the Jewish quarter. Visit the ruins of Heidelberg’s castle, and stop in Mainz, one of the ShUM cities, for a guided walk and a visit to the captivating Gutenberg Museum. Enjoy the opportunity to take a Jewish history tour in this fascinating city. Sail through the dramatic Rhine Gorge, the most beautiful stretch of the Rhine River. Your last stop in Germany is Cologne, where a guided walk shows you the highlights of this 2,000-year-old city. A stay in Holland’s popular, modern capital of Amsterdam is the perfect way to conclude this sensational European river cruise. And the best way to see the treasures of this 700-year-old city is on a canal cruise along the elegant Grachten lined with homes dating back to the city’s “Golden Age." Do not miss a visit to the ancient Jewish quarter. While sailing, Join onboard lectures to learn more about the European Jewish culture, history and traditions.